Dinesh Panday, second from right, is presented the 2018 Maize-Asia Youth Innovator Award by, from left, B.M. Prasanna, director of the consultative group on International Research Program on Maize (CGIAR MAIZE); Martin Kropff, right, director general of the International Maize and Wheat Improvement Center; and Mike Robinson, Syngenta Foundation for Sustainable Agriculture, Switzerland and MAISE Independent Steering Committee. Dinesh Panday, a University of Nebraska-Lincoln agronomy graduate student working and studying at the Panhandle Research and Extension Center, is one of the winners of the 2018 Maize-Asia Youth Innovators Awards. 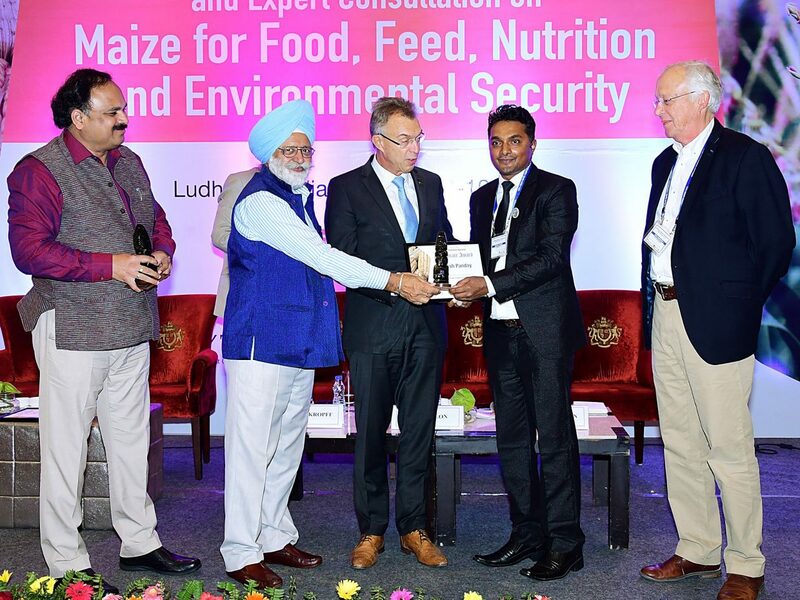 He was presented with the award at the 13th Asian Maize Conference Oct. 8-10 in Ludhiana, India, and was invited to present his work in maize research for development at the closing plenary session. Panday is a doctorate graduate research assistant in soil fertility and nutrient management and has been conducting research in the Scottsbluff area, while based at the Panhandle Center. His advisers are Bijesh Maharjan, assistant professor of agronomy and horticulture and soils and nutrient management specialist at the Center, and Richard Ferguson, professor and interim head of the Department of Agronomy and Horticulture. Panday's research aims to determine the effectiveness of high-carbon char in reducing environmental nitrogen loss and improving nitrogen fertilizer use efficiency in fertilized soils in semi-arid regions. The project uses sensors to detect maize nitrogen stress, predict grain yield and determine in-season and additional side-dress applications of nitrogen fertilizer, to reduce environmental impacts. The 2018 Maize-Asia Youth Innovators Awards recognize the contributions of innovative young women and men who can inspire fellow young people to get involved with maize-based research, change agency and farming. The awards aim to celebrate youth participation in maize-based agri-food systems and are sponsored by the Consultative Group on International Agricultural Research Program on Maize (CGIAR MAIZE) in collaboration with Young Professionals for Agricultural Development. "It was my honor to represent the University of Nebraska-Lincoln as well as my home country, Nepal, in such a glorious event," Panday said. "I feel privileged to receive this award and it has encouraged me to work more on maize-based agri-food system. I am very thankful to my adviser, Dr. Maharjan, for providing me continuous support and encouragement to grow professionally."